Megan Nonnemacher graduated from Saint Xavier University (SXU) in 2014 with a degree in Secondary Education. Nonnemacher was a four-year starter on the Saint Xavier softball team and left the program with the following records: Nonnemacher was a Capital One Academic All-American Player of the Year in 2014, while leading the Saint Xavier program with 85 wins and forth with total strikeouts. 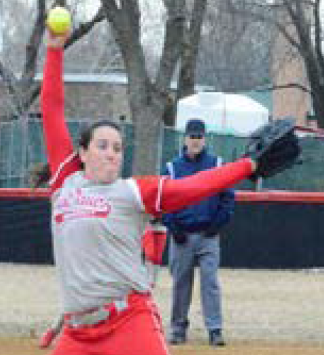 Nonnemacher has the second-best winning percentage, most games played, and most appearances in Saint Xavier softball history. Nonnemacher is ranked third in shutouts pitched. Megan Nonnemacher has remained active in the game and was named the Bloomington Junior High School Head Coach and BNGSA Angels ’99 Assistant Coach. Nonnemacher was previously the Bloomington High School Assistant Coach and Illinois Wesleyan University Assistant Coach. Nonnemacher has won at every level in which she has pitched and brings what she has learned to her classroom and the softball field. Pitching, fielding, and hitting have improved every year at BJHS since she has begun coaching. Nonnemacher also continues to refine her coaching skills by working with programs that have been very successful.